There was a discussion in the Lutelist about countertenor etc. singing. 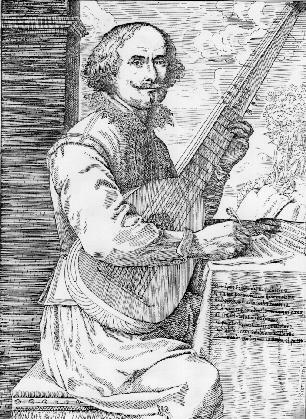 I sent there a comment by Bellerofonte Castaldi, an Italian composer and theorbo player. "... E perche trattano o d'Amore, o di sdegno che tiene l'Amante con la cosa amata, si rappresentano sotto Chiave di Tenore i cui intervalli sono propri, e naturali del parlar mascolino, parendo pure al Autor sudetto cosa da ridere che un uomo con voce Feminina si metta a dir le sue ragioni, e dimandar pieta' in Falsetto ala sua innamorata." "And because [the pieces] handle either the love or the anger the lover feels to the loved one, [the music] is represented in the tenor clef, where the intervals are proper, and natural to be told[!] by a male; it appears to the author to be a thing to be laughed at, when a man, with a voice of woman, expresses his reasons, and asks for pity in 'falsetto', to/from his loved one." Benigno, e cortese Leggitore, Questo Mazzetto di Fiori Musicali che col mezzo della stampa del gentilissimo Alessandro Vincenti, hora ti si porge, non lo sprezzar cosi al primo come fara' [sara?] forti qualche villano indiscreto, ma dagli una annasatina col giu ditio del orecchio, e caso che tu non senta quella refragrantia d'odor Sabeo, che al personaggio a cui si dedica pur si converria [? ]; scusa, & accetta il buon animo del povero Hortolano, che per la sterilita' del suo Giardino non ha cosa per hora piu' a proposito da mettere sotto al tuo naso delicato e schivo. Il quale digratia non si torca, perche l'Autore, come benissimo sa' fare, non habbia messo l'A.B.C. della Chitarra Spagnolissima sopra ciascheduna di quest' Arie che si faria pur anch'egli lasciato portare a seconda dal uso moderno, s'ei non si fosse accorto che poco serve simil Pedanteria a chi non sa' se non scartazzare, per mille spropositi che ne le cadenze occorrono mediante il geroglifico [geroglisico?] sudetto, e colui che sa' non ha bisogno che fe gl'insegni. In oltre dopo' la prima con lo stesso ordine ha' voluto sotto le medesme Arie metter l'altre parole ancora per commodita' del Cantante, havendo per esperientia che procendendosi a la maniera solita dal dargli uno sguardo cosi in cagnesco in poi che fa il Cantore, egli non se ne serve come de le prime, anzi le lascia cola' sotto abbandonate e sole come dal proprio Autore inconsideratamente furon messe. E perche trattano o d'Amore, o di sdegno che tiene l'Amante con la cosa amata, si rappresentano sotto Chiave di Tenore i cui intervalli sono propri, e naturali del parlar mascolino, parendo pure al Autor sudetto cosa da ridere che un uomo con voce Feminina si metta a dir le sue ragioni, e dimandar pieta' in Falsetto ala sua innamorata. Gentle and gracious Reader, do not despise at once, as an undiscerning villain would do, this little Bunch of Musical Flowers, which is now coming to You through the printing of the gracious Alessandro Vincenti, but take a little sniff at it with discerning ear and if you do not feel that fragrancy which should be proper for the Person whom this book is dedicated, forgive and accept the good-heartness of a poor Gardener, who has nothing else in his fruitless Garden to put under Your delicate and reserved nose. Please do not turn up Your nose just because the Author, being perfectly able to do it, did not put the A.B.C. of the Spanish Guitar above every Air. He [the Author] would have done it, as is in the current style, if he had not seen that such a Pedantry is just useless for those who can only flip through and that thanks to the above mentiond Hieroglyphic countless errors are made in the cadences. Who knows [how to do it] does not need to be taught. In the same Airs the Author put the words of all remaining strophes under those of the first for the benefit of the Singer, because in his experience he knows that the Singer usually look surly at them not to use them but to leave them abandoned and lonely at the end of the page, where the Author imprudently put them. And because [the pieces] handle either the love or the anger the lover feels to the loved one, [the music] is represented in the tenor clef, where the intervals are proper, and natural to be told[!] by a male; it appears to the author to be a thing to be laughed at, when a man, with a voice of woman, expresses his reasons, and asks for pity in 'falsetto', to/from his loved one.